BandagedEar.com expanded its inventory of Katsushika Hokusai art prints. BandagedEar.com is focusing on adding new art prints and posters from well-known artists to prepare for holiday shoppers. Katsushika Hokusai art prints are top-sellers on the online retail store’s website, so the new Hokusai additions to the inventory are expected to sell well. Discover "The Great Wave off Kanagawa" art print and other art prints from Hokusai’s series, 36 Views of Mount Fuji. The series depicts the famous mountain from a variety of vantage points in different seasons. Other Hokusai art prints, including "Puppies in the Snow" and "Dragon," are also now available. 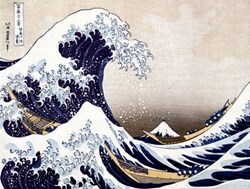 Vanessa Smith, marketing director at BandagedEar.com, said, "Katsushika Hokusai has a very interesting history. The artist was known by 30 different names during his career. He started out by painting Kabuki actors, went on to paint landscapes and eventually became a well-known Ukiyo-e artist. Framed Hokusai art prints are colorful and create a beautiful focal point in any space. The team at BandagedEar.com is excited about the new art prints available on the website." After choosing the perfect artwork, BandagedEar.com shoppers can choose from among millions of different framing configurations to create a one-of-a-kind framed art print. BandagedEar.com customers can enjoy a 25 percent discount on all prints and framed art prints from BandagedEar.com for the remainder of October. For more information visit http://www.bandagedear.com.